Questions are important in creating quizzes and eLearning contents. ActivePresenter makes the question inserting an easy task for you. Apart from using the Interactions tab, you can insert questions from slide layouts. That’s what we will learn in this article. In ActivePresenter, slide layouts contain position, size, and formatting of the placeholders and different elements in a slide. 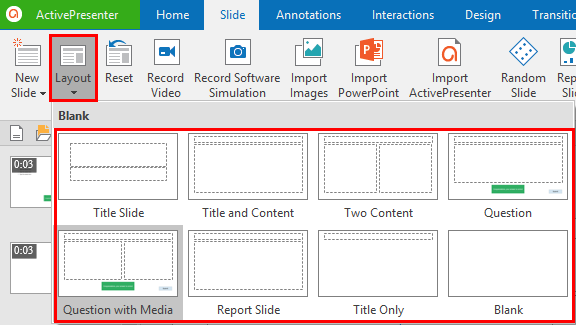 Placeholders of the slide layouts are designed with tool buttons (text, image, video, question, and report control) which provide you with a quick way to insert different types of object into slides. You can insert slide layouts in the Normal View or Slide Master View, depending on your need. The following content will show you how to do that in the Normal View. For the latter, see Use Slide Masters in ActivePresenter 7. 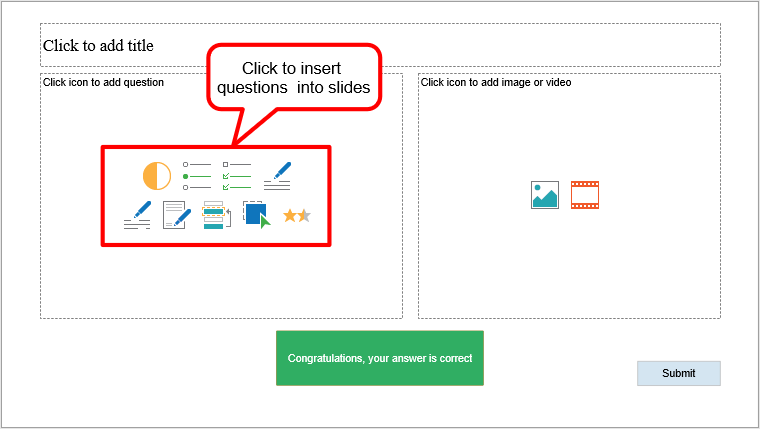 There are four out of six slide layouts have placeholders that include question tool buttons: Title and Content, Two Content, Question, and Question with Media. In general, the procedure is insert new slides, then insert questions from the slide layouts. Each slide comes with a layout. 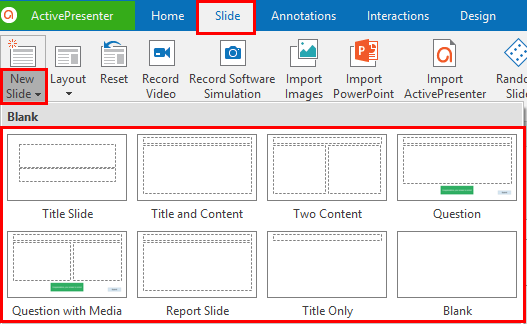 To insert a new slide, in the Slide (or Home) tab, click the arrow on the New Slide button and select a slide. The new slide will be inserted after the slide that you are selecting. If you simply click the New Slide button, the new inserted slide will have the layout of the slide that you are selecting (in the slide pane). Tip: To change the layout of the current slide, in the Slide (or Home) tab, click the Layout button and select the new layout. The newly selected layout will replace the current one. Alternatively, you can right-click the slide in the Slide pane and click Layout to change the layout of it. As you can see in the screenshot above, ActivePresenter provides you with some built-in slide layouts. You can use them or customize them, depending on your needs. Tip: After making a lot of changes in the slide layout, you can still come back to its original state. Just click the Reset button in the Slide or Home tab. After inserting a new slide, just click any of the question buttons to insert it. Consequently, ActivePresenter will insert the question into the slide, within its placeholder. You can work with the inserted question as normal. Note that after inserting question, you can still change the slide layout without affecting the content. Normally, inserting questions from the Interactions tab means inserting a new question slide. One question in one slide. Of course, you can have two or more questions in a slide by copying and pasting. However, with the Two Content slide layout, two questions will be inserted into two placeholders of the layout. No need to copy and paste. So, that’s how to insert questions from slide layouts in ActivePresenter 7. 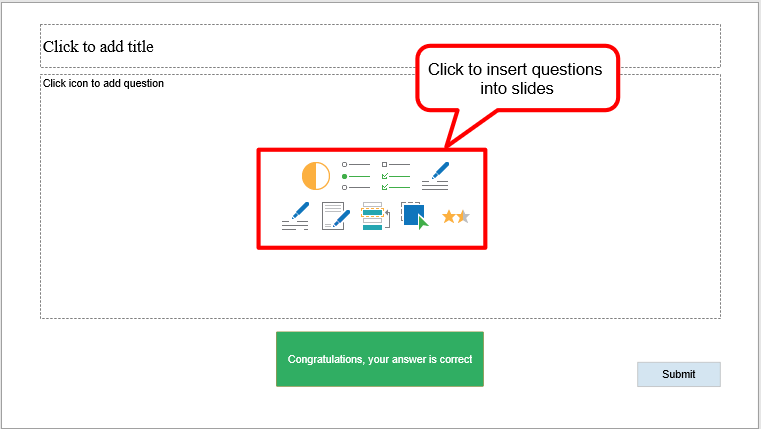 Use this method to create eLearning quizzes today. Don’t hesitate to email us if you need support.